Autophagy is an intracellular bulk degradation/recycling system for turning over cellular constituents. 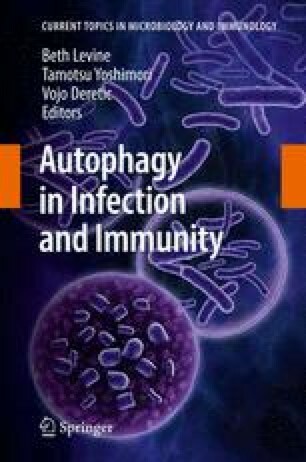 In one of the more remarkable findings among the recent developments in the field of autophagy, it was found that autophagy can also eliminate bacteria that invade host cells. The first evidence of this phenomenon came from an analysis of group A Streptococcus (GAS), the etiological agent underlying diverse human diseases. This bacterium is often internalized into nonphagocytic cells via the endocytic pathway, and then escapes from endosomes into the cytoplasm by secreting streptolysin O. The bacteria that escape into the cytoplasm induce and are captured by a unique membranous structure, which shares characteristics and molecular machinery with canonical autophagosomes but has some distinctions, including its large size. Subsequent fusion with lysosomes causes the death of most intracellular GAS. These findings have opened up a new field of innate immunity: the intracellular immune system against pathogens that penetrate the first defense of the endocytic pathway. The role of autophagy in Staphylococcus aureus infection is also discussed.